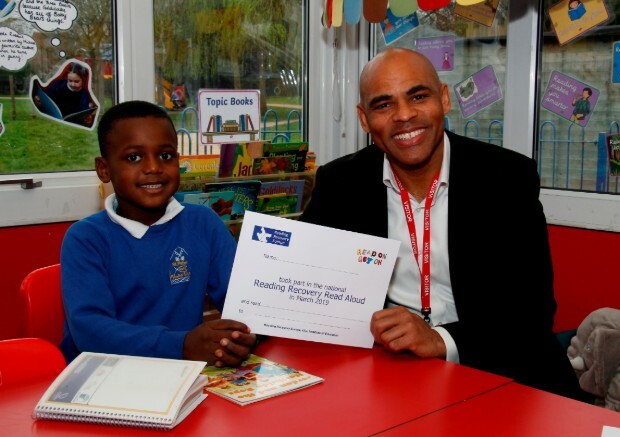 Pupils from St Peter’s Church of England Primary School in Bristol will read their favourite books to Marvin Rees, Mayor of Bristol this week, as part of Read Aloud – a month-long celebration of reading. The initiative is part of the University College London’s (UCL) Institute of Education’s (IOE) Reading Recovery, a school-based programme aimed at the lowest achieving children, aged five to six, helping them to improve their reading within 20 weeks. Reading Recovery involves a short series of one-to-one tailored lessons for 30 minutes every day with a specially trained teacher. The programme has enjoyed great success in Bristol for thousands of local children – eight out of ten children who take part in Reading Recovery catch-up with their classmates within six months. Forty-five per cent of the children who have benefitted from the programme are from economically disadvantaged backgrounds, with 32% of children removed from the Special Education Needs register after Reading Recovery. In the UK each year approximately 20% of children leave primary school not being able to read well enough to progress at secondary school. Research has shown that up to 120,000 11-year-olds enter secondary education without having reached their expected average reading age. Children across Bristol who have already benefited from the programme will get the opportunity to read aloud to high profile people throughout the next month, including local sports stars, authors and celebrities. Councillor Anna Keen, cabinet lead for education and skills, visited Glenfrome Primary to meet children who had participated in the Reading Recovery programme, said it was inspiring to see the confidence that reading aloud gave the children. “We know how important it is to give children the best possible start in life, and good reading skills help to lay the foundations of future success in education and beyond. Head teacher at St Peter’s Church of England Primary School in Bristol, Livvy Sinclair-Gieben said the children who took part in the programme had really enjoyed it and their confidence increased as their reading improved. “Reading Recovery has been transformative for so many pupils in our school. The programme opens many opportunities for each of the pupils both academically but also socially and emotionally. “Reading Recovery is an awesome intervention that enables trained teachers to pinpoint individual children’s confusions in reading and enable them to catch-up with their peers.